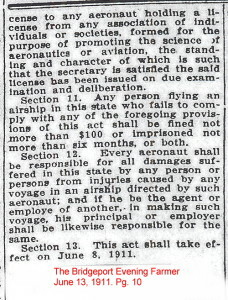 In November of 1910, Joseph J. Kopacka, and August Warzycki , both of Hartford, Connecticut, announced that they’d secured two government patents for an airship of their own invention. Their airship would include a triple compartment, triangular shaped air bag, with the center compartment being filled with buoyant gas, and the other two with hot air. The airbag would include two horizontal wings running the length of the bag, one on either side. The wings would be operated by a series of wires and levers connected to a passenger car suspended beneath the balloon. The airship would be powered by a high-powered engine of French design that would spin two large propellers. The men also announced that they would form the Aerial Construction Company, which would be incorporated under the laws of Massachusetts, with a capital investment of $50,000. The company would be located on Asylum Street in Hartford. At this time no airship had been built, but the inventors were working with John Twardoz, a former professor at the Vienna Technical School, who was calculating how large the balloon would have to be to achieve the required lifting power. Construction and testing of the airship would take place in the Poquonock section of the town of Windsor, Connecticut. Source: The Hartford Courant, “Hartford Men Have Invented Airship”, November 19, 1910. In or about August of 1908, Charles B. Whittlesey Jr., Age 9, of Hartford, Connecticut, saw plans for building a dirigible airship in a Sunday newspaper. The plans didn’t seem too complicated, so he brought the matter to his father, Charles Sr., who was superintendent of the Hartford Rubber Works. Mr. Whittlesey liked the idea of building a scale-model airship, and figured it would be good publicity for the rubber company. After enlisting the help of several workers, construction was begun in a vacant area of the factory. The finished airship had a cigar shaped gas bag that was eight-and-a-half feet long, and eighteen inches in diameter, made of “Indian Mull” and covered with rubber cement. It could hold fourteen cubic feet of gas. A framework was suspended beneath the gas-bag which held a small battery operated “Rex” motor that drove a four inch wide, three-blade wooden propeller 300 revolutions per minute. The entire airship weighed slightly less than four pounds. When completed, the airship was named the “Hartford 1”. Initial testing was done in November of 1908, and several successful flights were made in the back lot of the factory. The gas bag wasn’t large enough to lift the ship to any great height, and the ship lacked a rudder, but Mr. Whittlesey could see the potential and planned to make improvements on the initial design. The Hartford 1 was presented to Charles Jr. on his birthday, November 24, 1908. 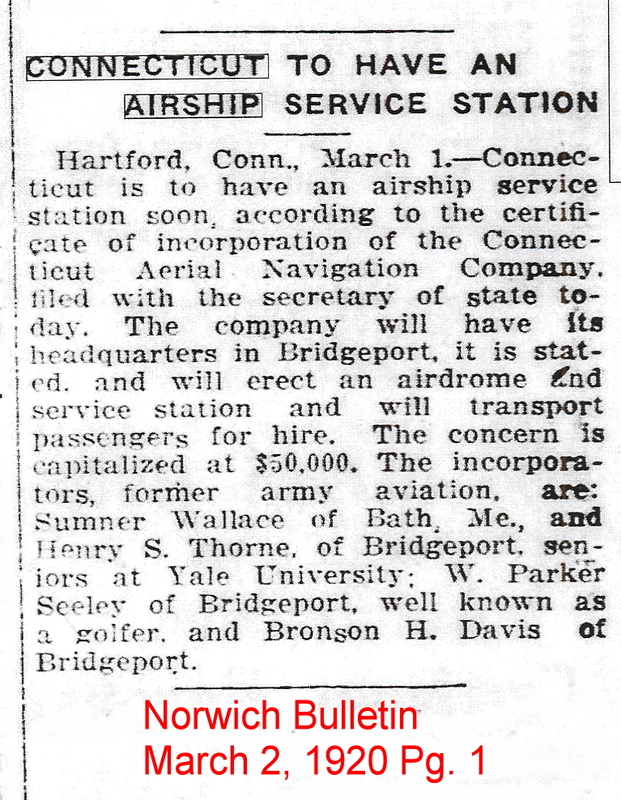 Hartford Courant, “The First Airship Made In Hartford”, November 24, 1908. 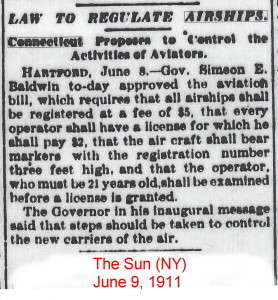 Connecticut was the first state to pass laws pertaining to airships and airplanes. 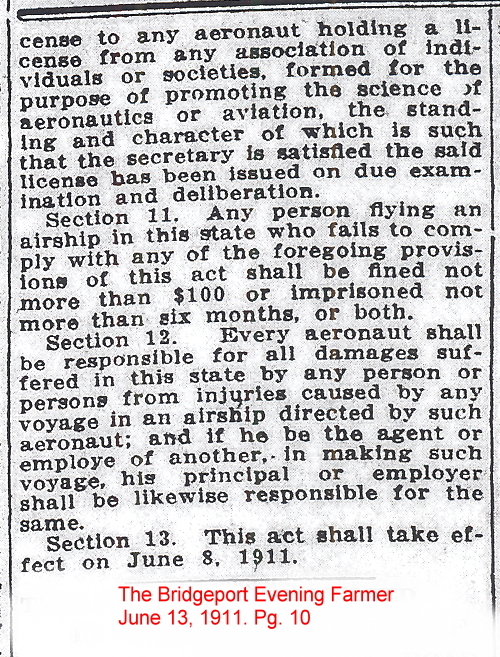 The laws took effect June 8, 1911. Some thought the law might not be Constitutional. 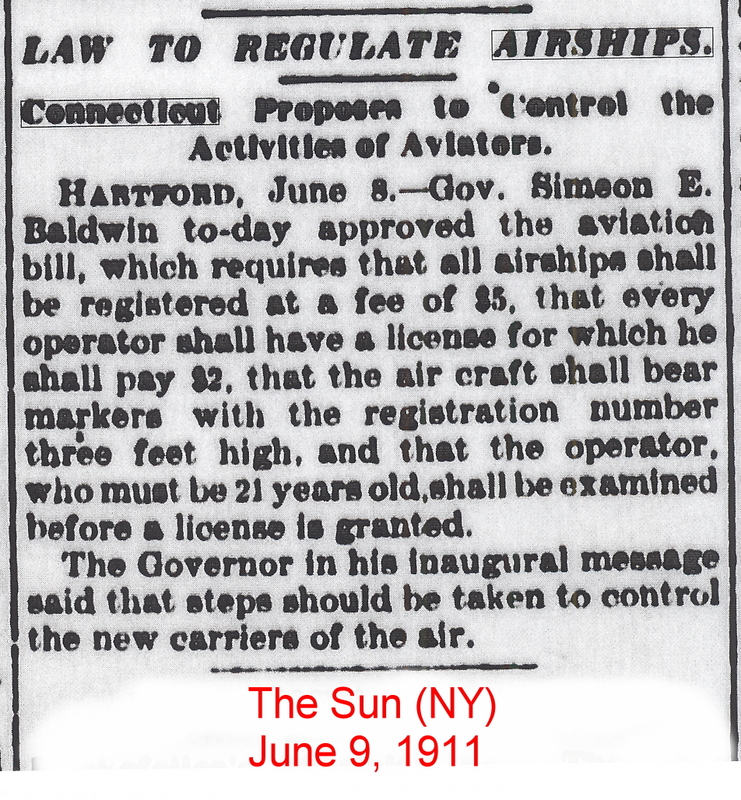 In October of 1911 it was ruled by Connecticut’s Attorney General that balloons were not airships, and therefore did not come under the new law. 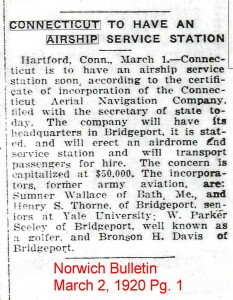 The following article appeared in the Norwich Bulletin, March 2, 1920, Pg. 1.